The actor forfeited his $10,000 bond and did community service, officials said. Dueling demonstrations erupted in Chicago on Monday over the handling of "Empire" actor Jussie Smollett's "hoax" attack case with a group led by the city police union demanding the resignation of the Cook County state's attorney and another group led by civil rights leader Jesse Jackson supporting the embattled prosecutor. 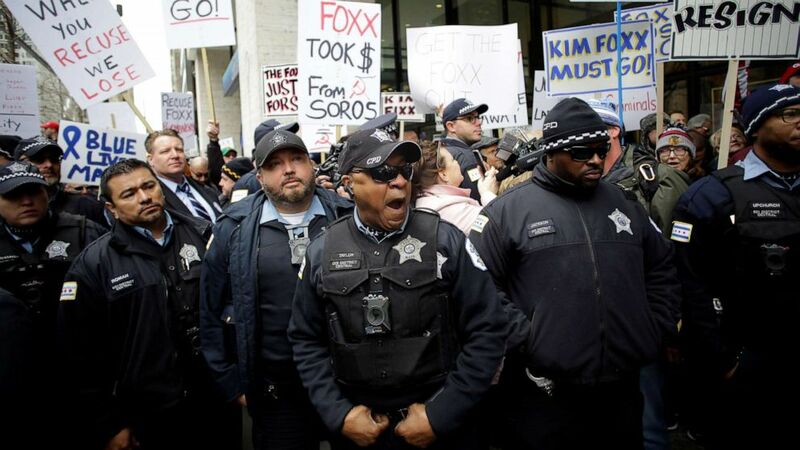 The demonstrations came a week after the office of Cook County State's Attorney Kimberly Foxx agreed to drop all 16 felony disorderly conduct charges against Smollett, stemming from what police officials described as a false report made by the 36-year-old actor who claimed to be the victim of a homophobic and racist attack in January on a street in Chicago. "Foxx must go! Foxx must go!" chanted participants of a demonstration outside Foxx's office. In a counter-demonstration just feet away that included members of the Black Lives Matter movement, participants expressed support for Foxx, the first African-American woman to serve as Cook County state's attorney. 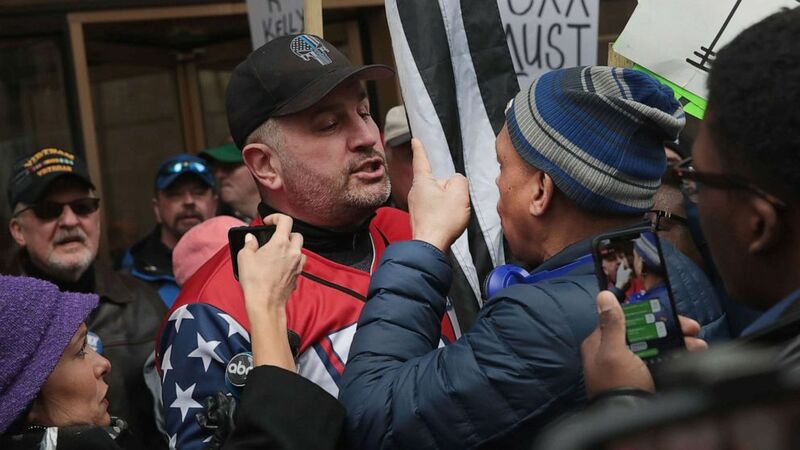 (Scott Olson/Getty Images) Opposing sides argue during a demonstration organized by the Fraternal Order of Police to call for Foxx's removal, April 01, 2019, in Chicago. Kevin Graham, president of the Fraternal Order of Police, noted that on Thursday the City of Chicago sent Smollett a bill for $130,106.15 to cover the overtime the Chicago Police Department expended to probe the attack investigators concluded was phony and intended to garner the actor publicity and eventually a pay raise. "We expended a lot of manpower and we've done a lot of work to make sure that this case was brought to trial, and it wasn't. That's a lot of money to just throw away," Graham said at the demonstration. Chicago Mayor Rahm Emanuel and Police Superintendent Eddie Johnson have blasted the decision to dismiss the charges and ridiculed Smollett and his attorneys for, as they saw it, mischaracterizing the case as an exoneration. (Nuccio DiNuzzo/Getty Images) Jussie Smollett speaks with members of the media after his court appearance at Leighton Courthouse on March 26, 2019, in Chicago. Neither Emanuel nor Johnson attended Monday's demonstration. Earlier Monday, Jackson and members of his Rainbow PUSH Coalition, rallied in support of Foxx at a Chicago church. Jackson said he stands by Foxx and her office's decision to dismiss the charges, calling the attacks against the prosecutor "unreasonable, unjustified and politically motivated." 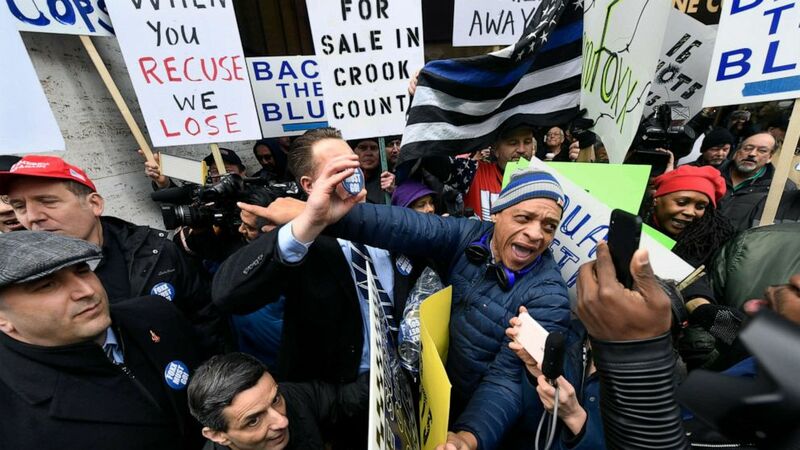 (Paul Beaty/AP) Dueling protestors clash over Cook County State's Attorney Kim Foxx's office's decision to drop all charges against "Empire" actor Jussie Smollett, April 1, 2019, in Chicago. Joining Jackson was the Rev. Michael Pfleger, senior pastor of The Faith Community of Saint Sabina Roman Catholic Church in Chicago. "The attack on Kim Foxx is not about Jussie," Pfleger said. "Rather, it's an excuse to try to remove a strong black woman who comes in the office of state's attorney to reform it." The final decision to dismiss charges against Smollett fell on Cook County First Assistant State's Attorney Joe Magats after Foxx recused herself from the case. The Federal Bureau of Investigation (FBI) is reviewing the circumstances surrounding the dismissal of the criminal charges against Smollett, two law enforcement sources briefed on the matter told ABC News. The sources insisted it is not an investigation, but a "review." 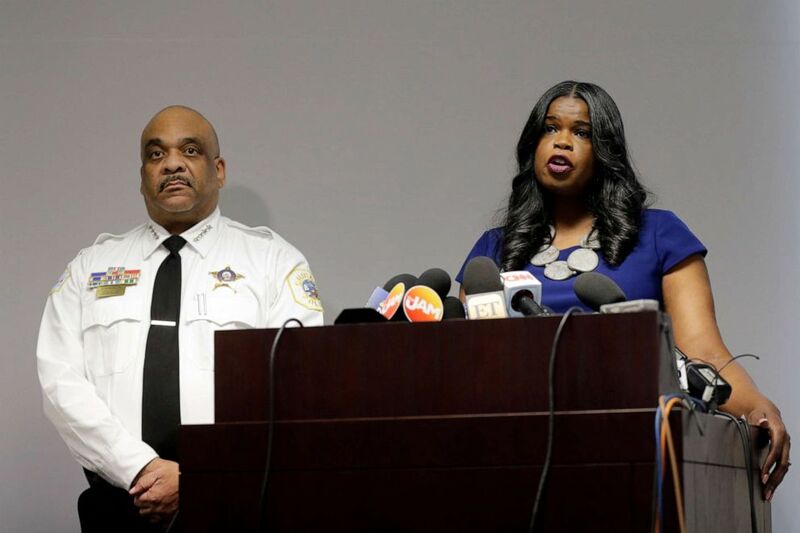 (Kiichiro Sato/AP, FILE) Cook County State's Attorney Kim Foxx, right, speaks at a news conference as Chicago Police Superintendent Eddie Johnson listens in Chicago, Feb. 22, 2019. Smollett told police that on Jan. 29, he was walking on a street near his apartment around 2 a.m. when he was set upon by two men. The attackers allegedly shouted racist and homophobic slurs and the words "MAGA country" before hitting him, pouring “an unknown chemical substance” on him -- possibly bleach -- and wrapping a rope around his neck, he told detectives. Magats and Foxx say the actor did not receive any special treatment. They said Smollett, who had no previous criminal record, was allowed to dispose of his case through an alternative prosecution program, just like 5,700 other people their office has charged with low-level felonies over the past two years. "I believe, based on the facts and the evidence presented in the charging decision made by this office, this office believes that they could prove him guilty," Foxx told ABC News last week. "I think this office, based on the charging decision, believes he is culpable of doing that." (Joshua Lott/Reuters) Chicago police officers stand in front of Fraternal Order of Police supporters protesting the handling of the Jussie Smollett case by the State's Attorney Kim Foxx in Chicago, April 1, 2019. Magats added, "This was not an exoneration. To say that he was exonerated by us or anyone is not true." Smollett could still face federal charges. The FBI and the U.S. 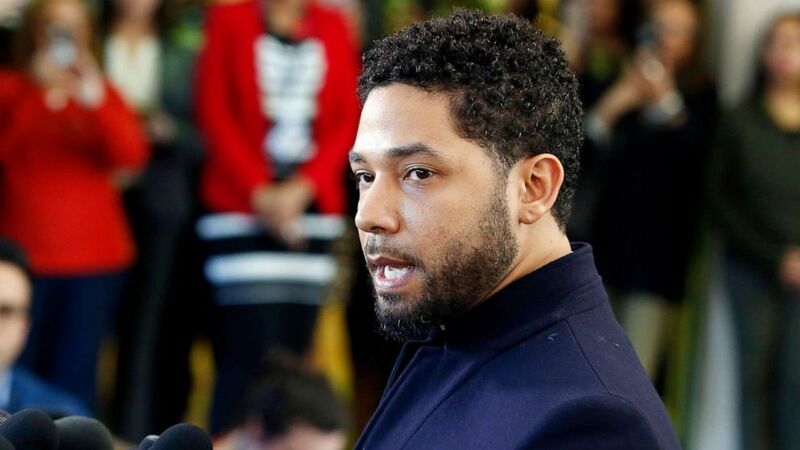 Postal Inspection Service are continuing their probe -- reported by ABC News on Feb. 20 -- into whether Smollett played a role in sending a threatening letter to himself prior to what police said was a staged attack on him, a law enforcement official briefed on the matter told ABC News on Tuesday. The letter was sent Jan. 22 to the 21st Century Fox studio where the television series "Empire" is filmed. 21st Century Fox -- which produces "Empire" -- is now a part of Disney, ABC News' parent company.